Hi Rager. just please keep an eye on weld of the folding mechanism on the frame. If you see ANY crack stop riding it. I have to say I didnt see a crack at all. As far as I can remember, mine was made in Taiwan. That would be a guestamate as I no longer have my broken bike, it's currently with Tern to be looked at. What is normal use ? How does somebody define regular riding ? Well MY average was just 40 minutes a day (10 minutes to the train station - 10 minutes from station to work and back again) on the road or through the park on a tarmaced cycle path, 5 days a week. Hardly taxing stuff for a new bike. I can quite assure you that what happened to me was real. Not only have I suffered injury but has been a MAJOR inconvience. I've had no bike for 3 months (Evans Cycles dont offer a loner), had to pay extra for public transport and had to have time off work when I REALLY should be at work!!!! I dont believe in claiming with lawyers... this pushes up the prices of the things you want to buy. All I wanted was a replacement bike and helmet and to get back on the road. I can now say that I AM now back on the road after a long 3 months.... sadly not on a Tern. Sorry but I've lost faith in it. Sad really as like I said, I really liked it, it rode well, folded small but I cant take the chance that "frame failures sometimes do occur." I've plumped for a Montague Paratrooper Pro.... which is built like a tank! I'm not going off road on it, but I needed to feel secure in the knowledge that the bike was sturdy. OK, doesnt fold as neatly as other folding bikes...or as small (It's a full size bike) but so far I'm pretty happy about it. As yet.... I still dont know what happened with the frame. It would be interesting to find out why though. I would think that the frame was under waranty and should have been replaced right away. Aside from any warranty obligations, it would be the right thing for Tern to do. Yes Josh and his team is definitely passionate about their bikes, same as I am and many others in th industry, but its also about profits, margins, spying competitors, lawyers, and such ... the ugly side ..so to speak . The Tern Philosophy however doesnt allow for ONE frame to break, no matter how many. The unfortunate owner of a broken frame doesnt care either about % even if it is 0.00001 percent ..Its his bike and he might have goten hurt .. so all the numbers dont matter. Tern bikes are just a tad heavier than some of the competitors, despite having same or even better component choices, a clear and factual sign, that Terns are built stronger and designed with a longer life cycle in mind. I know that in the very beginning Josh visited a Dutch Dealer who is know for his " radical" stance that a commuting bike should be " worry free" for at least 5 years when used every day. And the Tern Team set this as a major goal with their bikes. That doesnt mean that the frame breaks after 5 years... not by a longshot, but that the bike and the components will hold up for 5 years with just minimal routine service. That should mean for the average bike rider that the bike will be there for decades and decades...does that mean a lifetime warranty ? No, nobody with a right mind will make those claims. Besides usually those have some kind of write off and you get down to 10 % after 5 years ....hardly worth it, and only a marketing plot. Why the dealer didnt provide some kind of a loaner, or after a couple emails with Tern, a better bike to keep, is a little duisturbing to me, Although I could not guarantee such a service myself , I would at least try VERY HARD, and in the past with a certain other bike companpy I had very good success to make such things happen in a very short time frame. And than sort out the reason for the defect with all patience, knowing that the customer has been taken care of. But that is my stance, I am after all maybe a little more passionate after all, biz or not. Thanks Thor. I was not expecting EXACT numbers, just ball park figures. 5 50 500 5,000 10,000 50,000 500K ... whatever. I trust you but you are guessing a bit--it would be nice to hear a real number from Josh. A ball park number. But your suggestion that it is easily more than 10K would indicate that the 3 so far number is a blip statistically. Very unlikely to recur. If this is the fact, then Tern should just quickly replace the broken bikes under warranty to assuage any doubts about their commitment to their product line since evidently this is not the start of some massive recall, but just a few blips in the grand scheme. A few replacements out of the hundreds of thousands of bikes sold, if so, are easily dealt with as singular aberrations. Even pay any medical fees, too, since it is such a small number out of that total. Keep right on making any bike that sells over 10,000 with only 3 bad ones! That sounds pretty reliable. And take care of those exceptions. That other company used to offer a lifetime frame warranty on their bikes. Perhaps they still do. Is Tern's warranty a Five Year frame warranty? This would indicate how long they expect their bikes to last before defects begin to appear. Are the days of lifetime bikes behind us? Or is this the price of keeping the bikes light weight, and only the heavy clunkers last longer? I'd prefer bikes warranteed to last the lifetime of the purchaser. And I'd be willing to have it weigh an extra ten pounds or so to be able to build this into the frame, whatever the material. And to pay more for it as well. "The last bike you will ever need to buy." And then I'd recommend them to all my friends. And buy a second one as well. But that's me. Why is there the assumption that it is only three bikes involved? I would think it makes more sense to assume there are more than 3 bikes that have suffered frame failures. These bikes all appeared to have been purchased in 2013. This suggests an issue to my mind. Or were there also a number of bikes that failed in 2010/11/12 and it's the norm for there to be frame failures for every year's production? Sounds pretty scary to me, to be frank. Let's take in good faith Tern's assurance that they do all they can, but what can they tell us about what happened with the 3 bikes? Why did their frames fail? If there is no specfic reason Tern can pinpoint, let us know. This general talk of standards and all that is done to avoid frame failures doesn't really count for much when nothing specific is being said on the 3 frame failures under discussion. If Tern wants us to accept these frame failures as statisical bumps then they need to offer more explanation and details as to the connection between the standards and efforts made and the failures that actually occurred. If they can't do that right now, perhaps they might like to let us know when their investigation will be complete and they can share their findings with us. Nice looking bike by the way. Exactly the model - color and all - I was going to buy. And I'm still keen if Tern can reassure me with an explanation of substance. At this point, I remain unconvinced by the 'statistical bump' explanation. Of course, we don't have the real figures to work with quite yet. You are quite right that there may be many more than three--these are only those who have thought to come forward to say so on this forum. Tern may know of more who have notified them directly and not through this forum. And also we don't know how many of this model have been made and sold. I said IF it is only 3 out of 10,000, that would be a blip statistically. But those numbers are not authenticated. If they turn out to be 500 defects out of 2000 sold, that would not be a blip. We can not assess without the facts. But Thor may be right, Tern may choose not to reveal any numbers except what we can speculate on here--and we would not thus have any certainty. This cuts both ways, however, for while protecting themselves from competitors taking advantage of inside information, many potential buyers will hesitate to purchase products which have uncertain safety records. The fact of this forum speaks volumes of the openness of Tern to buyer feedback and transparancy. The completeness of this initiative is up to them. I am sure Tern will make good on these. But when you are making such massive quantities, as you intimate, it is impossible to prevent a couple from going out less than perfect. 100% perfect production is probably unobtainable. By analogy in the medical industry, even when vaccines are made which save millions of lives, there are always a few who will die from taking it due to an allergy or a wrong dose. Perfection is the goal, but there will always be a few less than perfect which get released, even with a perfect design, perfect materials, perfectly trained technicians, and quality assurance inspections. The key is not whether there are defects--there always will be such--but what Tern does to make it right for these few. But I have no doubt that these cyclists will be made whole by Tern. The recurring question here, debated back and forth, is whether this is such a blip--an unavoidable tiny fraction of defects with the vast majority going out perfect, or whether there are hundreds of these streaming back unknown to us here on the forum, or that the percentages being returned indicate a serious defect in design and a recall could be now in the planning phase. Since Tern is being coy about sharing these numbers at least so far, we are left to speculate and wonder. Where there is lack of transparency, rumor and speculation can run wild to fill the gap in information. This is true anywhere else, too. It will be remedied as soon as Tern is forthcoming with their analysis. Read my addendum to that post. I acknowledged that companies need to limit their liability, even though the bikes should last far longer if not abused. BTW, Dahon still offers their lifetime warranty if the bike is setup by LBS prior to first use, according to their current website, FYI. Do you guys have any idea how much tedius testing goes into a broken frame ? Metalurgy, will check for material, welds, and whatelse not, as this is usually done in an independent lab, this is not happening overnight, or in a week by that matter. Give them time to find out, or would yo all rather have some wishy washy explanation ... ? I am not rushing anybody. Some others here are itchy to get answers to know if it is safe to get back on their bikes. Still others are hesltating to buy pending the outcome of this issue. It seems to me that Tern itself ought to be the ones in a hurry on this one. But I agree with you, Thor, the tests ought to be thorough and clear, and the remedies well-founded. If that takes longer, it may hurt sales but in the long run the fix will be the best one. And that is the wild card in all of this: was the bike abused or taken past design limits. How many honest people out there will admit it when they broke something by misadventure rather than by product defect? The three guys here say no, and I guess it may boil down to what can be detected in the lab. http://www.trekbikes.com/us/en/support/warranty - "Frames for the lifetime of the original owner (except forks, the Session, Scratch, Slash, and Ticket model frames, and the swing arms on all full suspension bicycles)"
http://cdn.specialized.com/OA_MEDIA/pdf/General%20Warranty.pdf Specialized warrants to the original owner for the lifetime of the original owner of each new Specialized bicycle or frameset that the bicycle frame or frameset when new is free of defective materials and workmanship. The key is not whether there are defects--there always will be such--but what Tern does to make it right for these few. But I have no doubt that these cyclists will be made whole by Tern. I totally agree with the above and do not get angry with a company (unless they are negligent) when something goes wrong. But it is how they respond that tells me something about them. I bought a hybrid bike from Halfords about 5 years ago. After about 100 miles of riding, one plate on the chain came adrift under load, ripping off the derailleur, mech hanger etc and causing £150 worth of parts damage. Halfords stuck steadfastly to the fact that I must have abused the bike and refused a warranty claim. It was only when I sent them a high def close up photo of the bent plate, in which you could clearly see a little annulus of road dirt inside the hole, that they admitted that the final link in the Shimano chain had not been driven home properly (the end of the special link pin was sitting halfway through the plate and the dirt built up around that). Only then did they fix the bike. Strangely, I never bought another bike from them. Obviously there can be shading of the truth on both sides of the bike selling business. That is why it is important for companies to monitor patterns of failure to find if there is a common fault, which will help them differentiate manufacturing defects from the stunt riders. I am sure Tern will make good on these. Not touting my horn, although I am pretty proud about that, but to make a point. Tern is so young a company. As of yet, it hasn't yet been in business as long as its five year frame warranty. Dare I say that it is too soon to judge whether Tern's frames are defect-free bullet-proof. All we can reasonably say at this point is that, from what you are sharing, that Tern has sold no defective bikes which have gone bad just out of the gate. This is a good omen, and we can only hope their bikes are engineered to sustain this track record up to and beyond the five year limit to their warranty. But metal fatigue usually takes a long time to develop, so only time itself will reveal the strength of these designs. Are the three breaks mentioned in this thread mere blips in the theoretically massive number of Tern bikes which have been sold or the leading edge of a wave of defective bikes which have had a chance to fail over the months they have been in use while stress fractures propagated? Again, only time will reveal this. Although I do unerstand the concept of your comment, which is riding in a careless manner, out of honest concern I would like to ask your opinion if going up/down a normal curb (~15 cm ) qualifies as a stunt or if it is not the way the bike is supposed to be ridden. By going up/down I mean : (in really slow speed) braking, lifting the front wheel to the height of the curb and then shifting your weight to the front (so as not to overload the back wheel) until the back wheel steps up the curb. Vice versa when you go down (without the lift). Not MTB-style or BMX-style (bunny hops, drops, etc). If you see my city's road conditions, buttery smooth riding would be flying. There is no other way. Again, Thor, I am not being sarcastic. It is that things like these are never defined by manufacturers. Keith You need to loose that negativism. I prefer to call it "realism". I am supportive of Tern, and wish the best for this new company. But I will always side with the truth, and call it as I see it. I have no interest in Tern failing, but also I don't want to encourage Tern to make bad business choices which will ultimately doom their sales. So I believe I am serving Tern best by raising important questions while hoping for the best possible answers. I am not negative, I want the true answers to ultimately prove positive. A negative person just wants to pull down and destroy an organization; I want this company to make intelligent choices so that it can prosper. Perhaps Tern is already headed to complete success; if so that is wonderful. But conversely, they may have already made some wrong choices, and perhaps I can help them redirect to better choices. I don't presume to know all the right answers either, but perhaps together we can encourage them to find the right path. That is my intent. I am here to help. Tern bikes are out on the road since 3 years .... some early testbikes longer. With at least over 200000 Link frames out there ( my guesstimate ) there would be many many more broken ones. Metal fatique is not happening all of the sudden after 3, 4, 5, 10 years ... It starts from the very beginning of its use.... It is safe to assume that bikes would break right and left if there would be a problem. If a crack caused by metal fatigue takes six years to develop on a particular bike under average use, and the company has only been making that bike for three years, we will have to wait three more years before we start to see them being returned. Every bike design is different. The only test I ultimately trust is the test of time--it will reveal all defects. Of course in fifty years, with no bikes returned due to any defects, then we can state that the design is PROVEN. I hope that these designs are robust. But then we see these three, and I wonder how these got here. Should we wait longer to see if more cases appear? Or did we just flush out the only defects which will ever appear? Time will tell. But three years is not enough time to prove much yet. Wait and see. Also the Tern Team has decades of experience, yes the company is relatively young, but the peeps who design/work there are industry vets, specifically in the folding bike niche. The production places are well established and in business for many many more years than Tern is around, building millions of bikes under various trade names. I have to trust that these people are experienced at making bikes and that this is not a group of inexperienced beginners here. But there will always be the new innovative design which tries to be both pretty, and light weight, too--and perhaps with not enough emphasis on durability this time, and in spite of the knowledge of generations trying to create a balance of these qualities, will make a bike which can fail unexpectedly. The main thing great experience creates is a series of successes and failures: they learn what works and what doesn't work. And thus it becomes tempting to repeat what worked, and avoid what failed--but that doesn't lead toward innovation, just safe repetition which doesn't inspire new sales very well, but it does make for dependability in a product line. Any true innovation must therefore take risks. But as I said above, only time will sort out which of these were successful. I agree that riding style is the biggest factor outside the direct control of manufacturers. Their only hope is to build 'em stronger, and warn us what the warranty does not cover to hopefully get users to reign-in their misuse of the products. My Dahons are not made of aluminum, so I am not as worried as I might be since steel is much more forgiving of poor designs. But there have been failures of welds, which led me to reinforce the weak points in the design rather than just rewelding them as originally made. So my Dahons are stronger now than the day they were sold brand new. These generally lasted over twenty years before defects appeared. I doubt aluminum frames would go that long before revealing poor design. And the cracks spread gradually, allowing me to notice them as a weakness long before they became hazardous. My impression of aluminum is that perhaps it can be overengineered to avoid failure, but when they do fail, they do so suddenly, catastrophically. So I am not worried since I trust my steel and stainless steel frames. Thor, I appreciate that you are loyal to Tern. You should be since they are entrusting you with a good share of their American on-line sales. I am on your side too, because I want this company to prosper, too. But I should think that while you must be delighted that so far, with just these few exceptions, Tern bikes have been free of defects, you might share my concern that this could be the lull before the storm if they haven't engineered them as tough as they believe they have while chasing that "lighter is better" prize. I honestly hope that your faith in their designs continues to be rewarded. your discussion is a very american one; living on this planet is dangerous! The safest thing is staying in bed (hopefully). If you think this is too boring, do some steps into the kitchen direction, because riding a bike is dangerous. Right after that the next safer thing is riding a heavy non-folding steel bicycle. 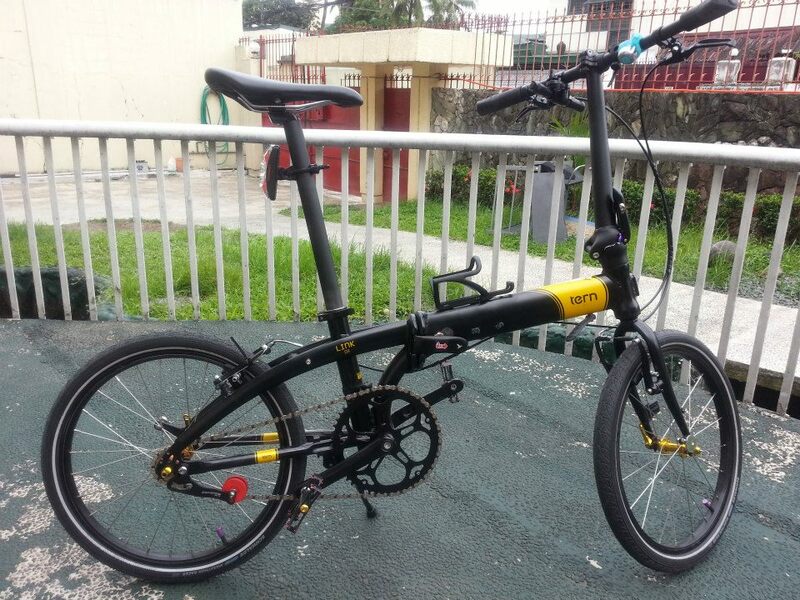 Buying folding bikes is dangerous, so maybe a heavy 25 kg steel folding bike? Too heavy? Better take aluminium? We all want light bikes, but aluminium alloy is a brittle material. But IMO there is no alternative to that. I think a failure quote of a few of 200.000 pieces is quite good. We don't know how the bikes were used, if they suffered hard bumps during shipping etc. IMO the manufacturer is responsible to offer me a bike that works. If my bike fails or parts of it, his job is to replace it. He is not responsible for my health or if I get injured. It is my responsibility to check my bike for cracks or other problems very regularly. All the rest is my personal risk of life. Any bike and any technical equipment can fail. If I don't trust a manufacturer, I choose another brand, but those products can fail, too. There is an option to aluminum and that is steel .Bromptons are made from steel. I'm not saying that would not break, but I do think you would probably have more time to notice the defect. But as I have said before not every body has the skill to recognize defects in a frame. I accept cycling is not risk free, but certain types of failures make your hair stand on end and a frame falling in two pieces is one of them, as would be a pair of forks breaking in two pieces as could happen on any bike. However years ago I had an accident and a car ran over the forks on my old Raleigh Tour de France. They were completely bent out of shape as was the front wheel. But the forks did not break they were made from steel and I wonder what would have happened with a pair of aluminum forks. As for these frame breakages I'm sure that Tern has designed the frame to be made out of aluminum and tested them very vigorously. I think at this point we are only speculating on how the breakages occured. Until the tests are complete who can really tell? Just returning the the forum to see if there was any update from anyone regarding these incidents as I STILL have not heard anything from Tern regarding the failure of my frame two months ago. I am sorry to see that there has been another frame failure, this time on a D7, which i believe is very similar, if not the same frame as the D8. I understand that it takes time to carry out these tests; however the failure on Lees bike was almost 3 months ago, mine two months ago and the most recent nearly a month ago and I have not had a single email from Tern regarding this matter since the one and only reply from my initial post. All the people on this site that say what a wonderful company they are, and they are doing all they can to help, and that their customer services are excellent. These people must have received a far better service than me, because I am disappointed in their total lack of communication and feedback. To clarify a few other points and questions asked; I agree it does seem unusual that all the reported failures have been in the UK, and on bikes purchased in early 2013; this would imply a batch issue to me also, but if so why are there no recall etc? I too rode my bike for about 40-50 minuites a day on paved roads and paths that did not have any significant surface defects. I never bumped up and down kerbs as I have some respect for my property, and the bike was not designed fo such a purpose (also the spokes were so prone to failure it would have worried me the wheel may collapse). As the last post says; steel frames are stronger and "may" give some more indication of potential defects, and my new bike although manufactured from steel is slightly lighter than the Tern. The Tern did ride more like a normal bike than the Brompton though, but felt more fragile... the Brompton feels bullet-proof; you can see why they command the money they do. I will let you know when and "if" I hear from Tern regarding my frame failure as it would be good to restore peoples faith in Tern as I am sure it is just a handful of bikes; I just don't want to see another person have this happen to them as i still haven't fully recovered from my injuries, and I was lucky......next time it could be far worse for someone else. I'm amazed that Tern have not contacted you about this failure. Even if it was to let you know they where investigating the faliure and how long it may take for you to get some results. Although Lee Tibbetts was the only one promised feedback ("I’ll let you know the findings once we have the frame at hand." -Amanda, 12/22/2013), it seems only fair that all three should receive at least *some* information. I confess to being disappointed to learn now that at least one of the three owners of frames that cracked has not heard back. I understand that this is a sensitive issue, and that the general Forum readership may not be entitled to a full disclosure from Tern. But the owners involved should be informed, at least about the status of the investigation into the frame failures, and it would be reassuring to hear that this has occurred. As there haven't been any more reports of this problem, and a recall hasn't been issued, I'm tempted to conclude that these were three isolated, though unfortunate, incidents and there is little cause for general alarm. But I think something could, and should, be said to put this issue to rest. I'd settle for hearing that the owners got a response; I'm not interested in knowing the details. Well, actually I'd love to know more, but I'm willing to be in the dark since it wasn't *my* frame. Nope..... not a word. I had a phone call from Mark (uk Tern rep) at the end of January to say that my bike had bene requested to be shipped back to the factory. Since then I've heard nothing. I, like others, would like to know what thier findings are.... even though I'm no longer a Tern bike user, and unfortunatly after all this probabbly never will be again. Sad really, as like I said in many of my posts, I did enjoy this little bike, it suited me very well until it suddenly bcame two unicyles. I, like 'Re-tern' still have injuries resulting from the snapped frame.